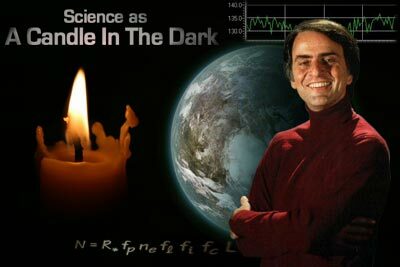 The Demon Haunted World: Science as a Candle in the Dark by Carl Sagan is a book consisting of 25 essays that challenge the beliefs of pseudoscience and explains the lack of knowledge of "real" science throughout the world. Topics such as alien abductions, astrology, Atlantis, channeling, crop circles, demons, ESP, the face on Mars, fairies, faith healing, religion/prayers, and UFOs and extraterrestrials (one of his favorite topics) among many others, are all thoroughly discussed throughout Sagan's book. Sagan uses science to portray the irrationality of each of these topics, and also explains the difference between science and pseudoscience multiple times throughout the reading. Sagan also portrays his fear for the increasing ignorance of science throuhgout the world; he fears that one day pseudoscience will rule over "real" science. Although Sagan denounces most of these pseudoscientific beliefs, he does a very good job at not being condescending; he understands why people would believe in such topics, since most people do not ever have all of the facts. Sagan uses intelligence and wit to explain both sides of each of the topics mentioned above. From reading the book, it is very clear that Sagan is a passionate scientist and loves what he does. At one point he even states, "When you're in love, you want to tell the world. This book is a personal statement, reflecting my lifelong love affair with science." Sagan systematically fights against pseudoscience while simultaneously portraying how aspects of "real" science can be just as wonderous and interesting as aspects of pseudoscience and superstition. Throughout the book, Sagan continually stresses the importance of science for the survival of society as a whole. Besides the abundant amount of information on UFOs and "alien abductees", I'd have to say that my favorite part of the book was the chapter about the "face on mars". Sagan spends some time talking about the surface area of Mars, the speed of the winds, and how old the planet’s matter is. He states that, given the area of the one small square containing the statue–estimated as being approximately 1 kilometer across–it is more probable it is a natural geologic formation than a leftover from an ancient, extinct civilization. This chapter was interesting to me, because "the face on mars" is something that I remember actually believing in when I was little. Now, because of Sagan, I know more about the topic. The chapter also portrays that we may just believe in pseudoscientific beliefs, because they seem to us to be much more interesting and fun. I also enjoyed reading the parts of the book that contained readers' responses. It was interesting to see the comments from everyday people on both sides of the spectrum. I commend Sagan for not laughing in the faces of some of the people that claim they have been abducted by aliens; he understands that there is something much more deep to those situations, whether those people have been sexually abused, etc. Most would call people like that crazy, but, despite being an extremely smart scientist who revolves his life around science, Sagan understands. I do not believe I could have read a book, besides our text book, that relates more to our Pseudoscience and the Paranormal class than The Demon Haunted World. Sagan uses logic and scientific evidence to disprove pseudoscientific beliefs, yet he does not belittle these beliefs. Sagan provides a plethora of evidence, and explains that most of the pseudoscientific topics lack any kind of scientific evidence whatsoever. Sagan also offers both sides of each topic, explaining how it is very easy for people to believe such topics, if they do not know much about science, which, according to him, about 95% of the population is "scientifically illiterate". The Demon Haunted World has really opened my eyes to just how important science is to our future, and to just how ignorant most people are about science. Like Sagan, I do not believe that it is absolutley bogus for people to believe in the pseudoscientific beliefs that are out there, because I know I have always been uncertain about a lot of them myself; however, I do believe that science needs to be taken much more seriously. Sagan explains how most people are afraid of science, because it tells them things that they do not want to hear, which is why they turn to pseudoscience. Surprisingly, a huge theme throughout this book seems to be that the world actually is haunted by demons; yet these demons that Sagan indirectly refers to are not paranormal. Sagan implies that the demons of our world are ones that compel us to believe in claims without good reason; we simply accept statements of political and religious authority, and are assured that ideas that comfort us are most likely to be true. If people do not want to read this book, although I do highly recommend it, this YouTube video portrays Sagan and his beliefs pretty well. Sagan was an extremely smart, understanding man, which is what makes his book stand out from other skeptics. Sagan understands people; he also understands that ignorance in science could lead to our downfall as a people.